InterPoker is an online poker site that has been around for a long time, but also one that has been a part of many different groups. Its modern incarnation is a member of Boss Media, one of the smaller online poker networks. In spite of that, you should still give this site a closer look because of the reasons discussed below. InterPoker has had many software packages over the years, but the Boss Media software package that it currently uses is arguably the best one around. The graphics are fantastic, the interface is ridiculously easy to use and you’ll find that it takes up virtually no system resources even if you decide to play with the full list of features that it has. Boss Media certainly entered the market with a bang directly as a result of its software package and that is one thing heavily in favor of InterPoker right now. InterPoker has had many gaming selections over the years just like software packages, but right now it takes its cue from the Boss Media Network. Unfortunately, this means that only Texas Hold ‘Em for smaller no limit table stakes would be reliable around the clock. You will see other games and limits offered (namely Omaha, Omaha Hi/Lo, Seven Card Stud, Five Card Stud and Five Card Draw), but the fact of the matter is that most of those tables won’t have enough players at them to form a good game even during the peak periods of time. InterPoker has a multi-deposit welcome bonus that can net you up to EUR 1000.00 when all is said and done. All you have to do is make the deposit and then earn 150 frequent player points for every single five Euros that you’d like to withdraw. The bonus is yours to play with and withdraw as soon you’ve met the clearance requirements and if you earn enough points you can get the entire EUR 1000.00 amount. 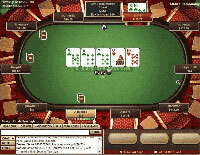 Players from the United States are not allowed to play online poker at InterPoker. InterPoker has a long history of excellence in customer support. They regularly add to their online help files and you’ll find them to be amongst the most extensive in the industry. If you require additional help, you can get it through e-mail (support@interpoker.com) and phone (00-357-22-55-26-82). Some might interpret the movement of InterPoker as instability, but nothing could be further from the truth. InterPoker has done nothing but create stability for their clients over the years, making sure that their site was in the best position possible so that their customers could benefit more. It is certainly a newer InterPoker that is with Boss Media now, but the same excellence is still there. It is still one of the best online poker sites around.